Shares in Barclays closed 7.4% down after its third-quarter profits figures came in below analysts' expectations. Profits for the period were up by 31% to £1.1bn, giving the bank a profit for the nine months so far of £3.4bn. But its investment banking profits were down from £1bn to £652m, in what the bank said had been a difficult quarter for its markets business. 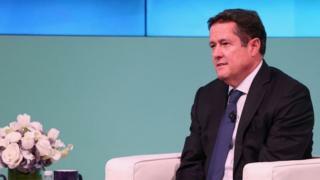 Barclays boss Jes Staley is currently being investigated over claims he tried to uncover the name of a whistleblower. The whistleblower wrote a letter that raised questions about the decision to employ one of Mr Staley's old colleagues from his JP Morgan days. Barclays shares are getting hammered on continuing concerns over the performance of its investment bank where revenues were down 18%. Reviving this bit of the bank is the centrepiece of chief executive Jes Staley's strategy and there is little evidence he's delivering as Barclays is underperforming its peers. Already under scrutiny by the regulator for his handling of a whistleblowing incident, he is now under pressure from shareholders growing impatient with the profitability of the UK's only global investment bank. Barclays is also embroiled in a fight with the US government over how many billions it should pay in fines for its role in selling risky mortgages. Plus, it's been charged with fraud over funds raised in Qatar after the crisis. Mr Staley asked shareholders to keep faith with him today - but with the bank currently valued at just over half what its worth on paper - for now, he's preaching to the unconverted. Barclays has already reprimanded Mr Staley for his conduct, but the matter is still being investigated by financial regulators the Financial Conduct Authority (FCA) and the Prudential Regulation Authority (PRA). Mr Staley is in charge of the UK's only remaining major international investment bank. Weak profits in investment banking are widespread, as activity in bond markets is muted against a background of abnormally low interest rates, which make it difficult for banks to slice off profits. Barclays, however, said profits growth had been driven by a £932m reduction in operating expenses and its performance had been encouraging. Its UK banking division saw an improvement in profitability and what it said was a "good underlying return" from its consumer, cards and payments business. Mr Staley said these results were important as they were the first for many years in which "we have not been in some state of restructuring". They were also helped by an absence of further provision for payment protection insurance (PPI) mis-selling. In the first six months of the year, the bank set aside £700m. Its total provisions for PPI stand at £9.1bn. That could spell the end of the PPI scandal that has blighted UK banks' reputation and results. The bank also confirmed it was setting up a separate UK banking division to keep its day-to-day banking operations apart from the riskier investment banking, as required by new rules brought in to stop a repeat of last decade's credit crisis. Laith Khalaf, senior analyst at stockbrokers Hargreaves Lansdown, gave a broad welcome to the results, but highlighted the investigation into Jes Staley - and the long list of other inquiries - as worrying. "Litigation still remains a risk for Barclays, with more than 20 separate investigations ongoing, not least one relating to Jes Staley's attempt to uncover a whistleblower in his own ranks," he said.